See full report and statistics below. Greater Toronto Area REALTORS(r) reported 1,287 transactions through the TorontoMLS system during the first two weeks of 2014. This result was down by approximately eight per cent compared to 1,396 sales reported during the same period in 2013. New listings entered into the system were down by a greater 20 per cent year-over-year. 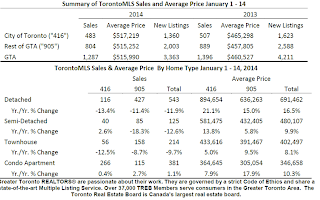 "The expectation is that home sales through the TorontoMLS System will be up in 2014. This is because the cost of purchasing an average priced home, including mortgage payments, property taxes and utilities, will remain affordable for a household earning the average income in the GTA," said Toronto Real Estate Board President Dianne Usher. "Aside from the fact that January sales from year-to-year tend to be volatile, the dip in sales during the first two weeks in January was likely due in large part to a lack of new listings. Quite simply, some would be home buyers could not find a home that met their needs," continued Ms. Usher. The average selling price for the first 14 days of January 2014 was $515,990 - up by 12 per cent compared to the average price reported for the same timeframe in 2013. 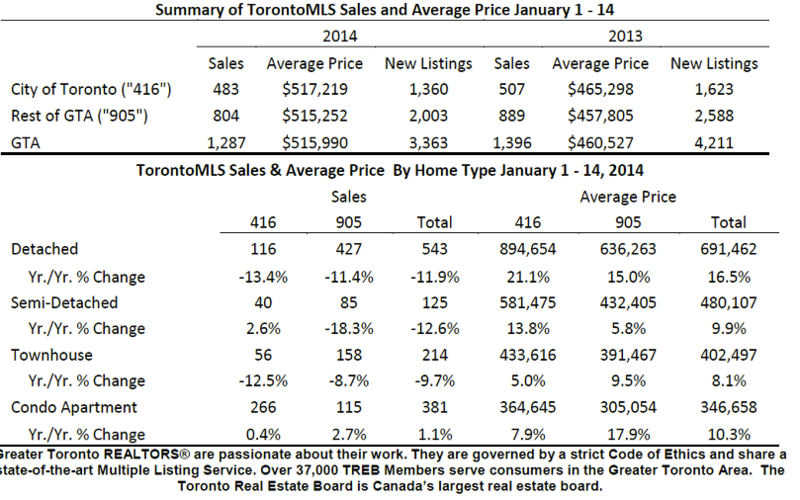 "The average selling price in the GTA will continue to trend upward in 2014. Listings will remain below the pre-recession peak and sales are expected to increase over 2013. This means that we will continue to see substantial competition between buyers for some home types and in some areas of the GTA," said Jason Mercer, TREB's Senior Manager of Market Analysis. Bank of Canada Keeps Prime rate at 1% again!